Does the City rent any of the parks? The City of Marshall is accepting orders for Park Bench Memorials. If you are interested please contact Phil Smith at 269-558-0324 for information. The City of Marshall is fortunate to have 7 designated park properties and a number of open spaces encompassing approximately 233 acres available to the public to enjoy. The Department of Public Works is the department assigned the task of maintaining these properties and their amenities which include restrooms, playground equipment, ball fields, picnic tables, picnic pavilions and a community band amphitheater. Brooks Memorial Fountain Park, is located in the center of town. The fountain was built in 1930 by Harold Brooks and modeled after the Temple of Love in Versailles, France. Brooks Memorial Fountain often serves as a backdrop for weddings and features colored lights that illuminate the fountain at night. The park features several benches and is a relaxing spot on sunny days. Brooks Nature Area, with over 180 acres, offers opportunity to explore wetlands, remnant hardwood forest, restored native prarie, and lake shore areas. This park includes two miles of trails, 88 acres of prarie, 300+ year old trees, wildlife viewing, and lake overlooks. A variety of bird species can be observed in the nature area. Trails are ideal for hiking, biking, or sking. 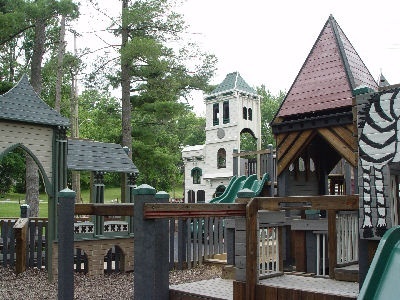 Ketchum Park is a favorite with kids who enjoy the park's large playground. The park also has two shelters for picnics. Stuart's Landing has picnic areas and a gazebo that overlook the Kalamazoo River. The park includes a band shell for concerts and serves as a starting point for the Marshall Riverwalk. Marshall Athletic Field is a recreation complex on Michigan Avenue. The park features baseball/softball diamonds and a football field. At the back of the park, there is a playground and several sand volleyball courts. Carver Park is a small city park on the corner of Exchange Street and Michigan Avenue. A gentle-flowing fountain is in the center of the park and bordered benches and beautiful flowers during the summer. Shearman Park is the newest park to our system. Teh park currently houses the ice skating rink in the winter and the city hopes to develope the park soon pending grant awards. The City of Marshall has implemented an Adopt-a-Park program in order to reduce litter, enhance and beautify the environment, and generate community support. Program applications, rules, and liability waivers can be viewed here. The city does not reserve any of the park spaces for use but allows for the use of the area on a "first come, first serve" system. The community Band Shell can be reserved by contacting the Public Services Department at (269) 781-3985. Click here for a parks map.